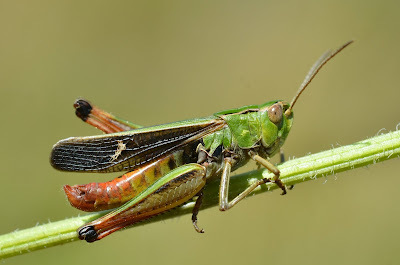 Male Stenobothrus lineatus, copyright Gilles San Martin. Stenobothrus is a genus of grasshoppers found in Eurasia and Africa, characterised by the presence of a tooth on the ovipositor. [B01] Bolivar, I. 1901. Orthopterák [Orthoptères]. In: Horváth, G. (ed.) Zichy Jenő Gróf Harmadik Ázsiai Utazása [Dritte Asiatische Forschungsreise des Grafen Eugen Zichy] vol. 2. Zichy Jenő Gróf Harmadik Ázsiai Utazásának Állattani Eredményei [Zoologische Ergebnisse der Dritten Asiatischen Forschungsreise des Grafen Eugen Zichy] pp. 223–243. Victor Hornyánszky: Budapest, and Karl W. Hierseman: Leipzig. [F01] Field, L. H. 2001. Stridulatory mechanisms and associated behaviour in New Zealand wetas. In: Field, L. H. (ed.) The Biology of Wetas, King Crickets and Their Allies pp. 271–295. CABI Publishing: Wallingford (UK).